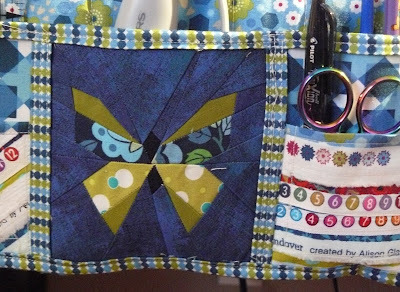 Heide's Quilty Hugs: A place for things. Hello my quilty friends! 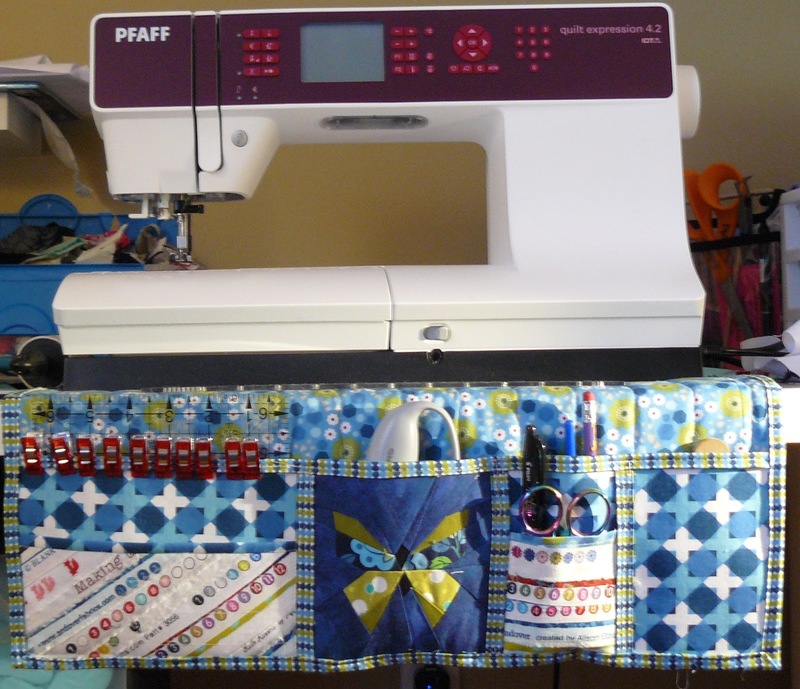 Today I have a sewing machine mat with pockets for you. I really wish I were a little more organized in my sewing space. 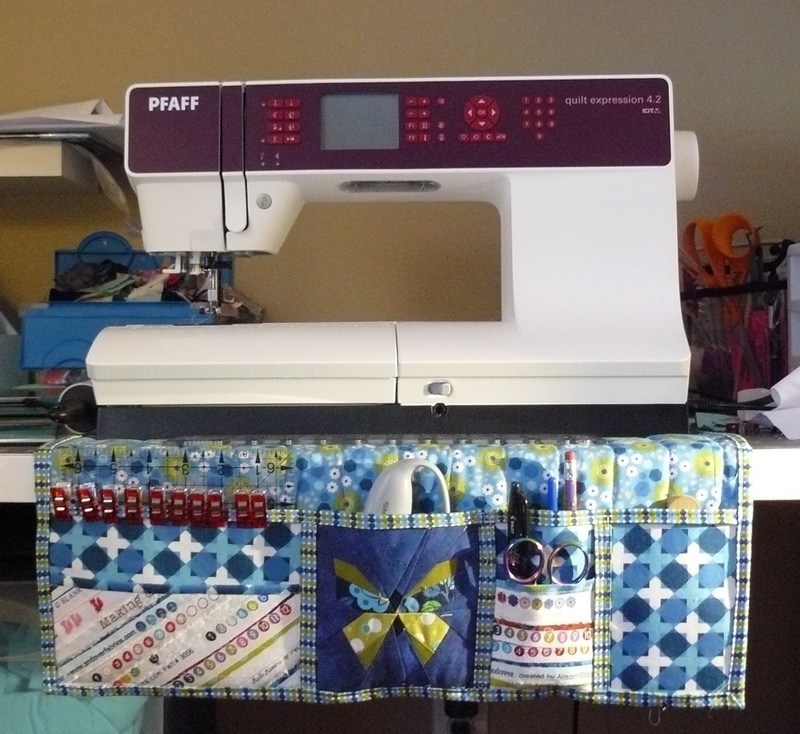 I look on Pintrest and other blogs and drool over how nice some of the sewing spaces are.... Oh it will happen some day! So until that day..... 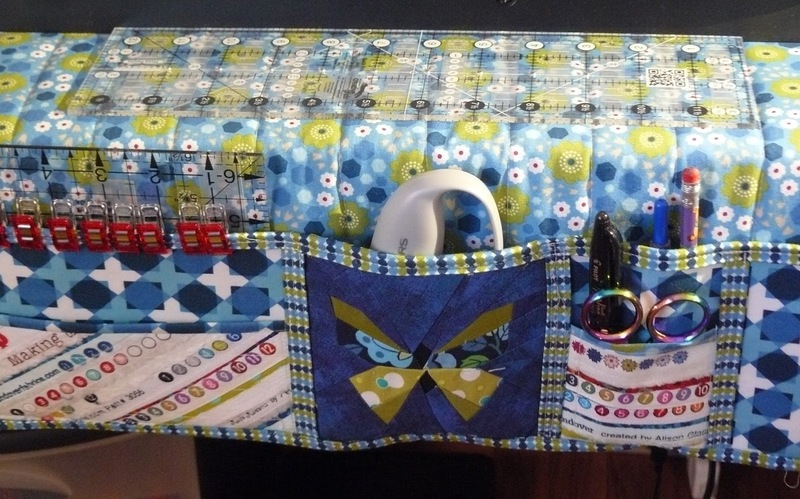 I saw this sewing mat over at Lilly ella and I knew I could use this to keep my scissors, pens, cutter and the always used seam ripper in one spot and that I will not lose them, like I normally do while sewing. I knew I had to make it! I found this great fabric at my local quilt shop and feel in love with the colors plus it matches the rug in my sewing room. Above is a closer look of the selvege pockets that I made as well as the paper pieced butterfly which is also a pattern over at Lilly ella. This was a fun easy project. I super happy with how it turned out. I really like the flower fabric...such sweet little flowers. My table is just a cheep little table from Ikea and it is starting to chip on the edges and I keep snagging my sweaters, so my new little mat is going to stop this from happening. Yea! That is so nifty, I have a mat under my machine, as I slide it to the right when I have my laptop there, but having seen yours with those so handy pockets, need to make a new one. Lovely fabric and the patterns on the pockets!!!Superb. Looks like a fantastic way to start being more organised, everything very handy. What a great finish!! I love it. It's super handy and a great addition to your work area. I've been thinking about making a sewing machine mat also. You have inspired me to "get with it"! This is gorgeous and I love the butterfly! I have seen these and wondered about making one but my sewing table has a little drawer in front which I wouldn't be able to access ..... I will just have to admire everyone elses! Your mat is fantastic. I've been thinking of making one, too. It just seems to keep dropping down the line, but yours looks awesome and organized. I should do like Judy and get with it, also.